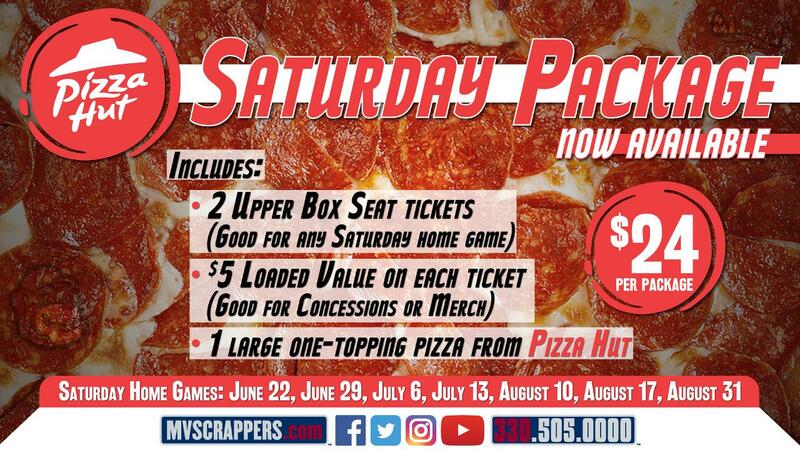 NILES, OH - The Mahoning Valley Scrappers are pleased to announce a Pizza Hut Saturday Package for the 2019 season. The package includes 2 Upper Box seat tickets to any Saturday home game, $5 loaded value on each ticket (valid for concessions or merchandise) and 1 large one-topping pizza from Pizza Hut for only $24. This ticket offer is available online by clicking here, at the Chevy All Stars Box Office at Eastwood Field or by calling (330) 505-0000. Advanced purchasing is encouraged. The Scrappers Saturday home games include June 22, June 29, July 6, July 13, August 10, August 17 and August 31. The Mahoning Valley Scrappers are the Short Season Single A Affliliate of the Cleveland Indians. The 2019 Home Opener will be Sunday, June 16 at 6:35pm against the Batavia Muckdogs. For more information about single game tickets, ticket packages or group outings visit mvscrappers.com or call the front office at (330) 505-0000.